Agata Schindler: The history of the Jewish Cultural Association Dresden 1933-1938. Why did the Silence last so long? The History and Philosophy Department Dr. Moshe Carmilly Institute for Hebrew and Jewish History, Cluj/Napoca 2006, p. 349-366. I remember in the late 1960s, when the famous Czech conductor Karel Ancerl left Prague, I was confronted with a certain thought that touched me deeply. Back then, I was a music student at University in Bratislava. It was the first time that I realized that that conductor was a survivor of the concentration camps in Theresienstadt and Auschwitz. I could hardly imagine that this outstanding artist, to whom sold-out concert halls applauded worldwide, could have experienced such humiliation; that he could have ever suffered such a fate. It was incomprehensible to me that, at that time, he was one of many numbered prisoners – someone sentenced to death. In actual fact, he had entered the most beautiful profession – he was a musician. One could not possibly treat him like the others; I was convinced at that time. There was hardly anybody with whom I could have shared these thoughts. However, more than a quarter of a century had to pass before the history of Czech and German music and the fate of Jewish musicians in the Third Reich has become object of both my interest and research. More than 450 years of music in Dresden have shaped the history of European music; Dresden and its music have always been worth researching. Consequently, it seems surprising that parts of the music’s past – more then five decades of it – have been evaded and neglected. In contrast to older editions, current encyclopaedia, no longer mention people who had formed the musical life of Dresden until 1933. An example to be mentioned is the essay “Dresden”, which is found in the first edition of the encyclopaedia “Die Musik in Geschichte und Gegenwart”. The authors claimed that musical institutions “remained intact inwardly” and were “after the destruction of 1945, soon brought back to life”. Despite casual reference to the Dresden scene back then, until the late 1990s of the 20th century, there had existed no specialized publishing related to the Nazi-persecution of musicians in Dresden and relating to the music life of the Jewish people in Dresden from the year 1933 until 1945. With regards to the proportion of Jewish musicians which had participated in Dresden’s musical activities, the “Gemeindeblatt der Israelitischen Religionsgemeinde” (Journal of the Israeli’s religious community, in the following referred to as “journal”) serves as essential contemporary witness. This “journal”, which was first published in 1925, was not only a source of internal information for community members, but also conveyed particular details of the music. Within the parish, there existed in addition to the synagogue’s choir, the Jewish Youth Orchestra Dresden. Among the outstanding personalities of the community, the following are to be named: Rafael Hofstein and Leo Fantel, connoisseur of synagogue music. The “journal” provides reference to selected musical events in the city. Among those referenced are both concerts of the Synagogue’s choir and non-Jewish, internationally renown interpreters. Yet, those events mentioned in the journal, are certainly only a fraction of the city’s rich musical history. In the early Twenties and early Thirties, Dresden had welcomed a number of internationally respected interpreters – often integrated in grand music events. Until 1933 Dresden was connected with such musical phenomena as Leo Blech, Carl Flesch, Hans Gál, Berthold Goldschmidt, Jascha Heifetz, Rudolph and Paul Hindemith, Bronisław Huberman, Paul Kletzki, Darius Milhaud, Oskar Nedbal, Gregor Piatgorski, Karol Rathaus, Alma Rosé, Artur Schnabel, Arnold Schönberg, Erwin Schulhoff, Franz Schreker, Alexandre Tansman, Richard Tauber, Mario Castelnuovo-Tedesco, Ernst Toch and Kurt Weill – just to name a few of those who would later be ostracized. They enriched Dresden’s musical tradition and contributed to its fame, partly personally or with their premieres. In connection with the concert cycle of “Neue Musik Paul Aron” (”New Music Paul Aron”), which represent a unique experience within the European context, between 1920 and 1931, the performances of composers from the “Zweite Wiener Schule” (”Second Vienna School”), “Groupe des Six” and many more composers– took place. Unfortunately, the Dresden era of conductors Fritz Reiner and Issay Dobrowen were put to an end respectively in 1922 and 1924. They left the city due to anti-Semitic public opinion. Moreover, the two musicians Arthur Chitz, and Richard Engländer were both having an effect on Dresden; they both held PhDs in music history, and the latter can be traced back the early 20ies. Violinist Francis Koene – since 1926 first concertmaster of the Sächsische Staatskapelle – belonged to the most treasured chamber musicians of the city. Virtuoso violinist Szymon Goldberg and Stefan Frenkel were his contemporaries and had been sitting right next to the conductor’s desk of the Dresdner Philharmonie. In addition to all of this, there was also a well-established soloist ensemble performing out of the Dresden opera house. Fritz Busch hired for example the young singer Maria Elsner, who immediately caused a sensation. All the people mentioned, contributed to and thrived within the musical atmosphere enjoyed the atmosphere that both demanded creativity and demanded innovation. However, with the beginning of the 30ies, the new political agenda loomed before Dresden’s flourishing musical life. After a concert, which was organized by the “Richard-Wagner-Verband deutscher Frauen” (”Young women’s union Richard Wagner”), on September 25, 1930, the official daily paper of the Nazi party NSDAP area Saxony – “Der Freiheitskampf” – criticized that the Jewish department store Alsberg had been chosen as venue and that “the Jew Goldstein” had been engaged as accompanier. Related to Paul Hindemith’s planned performance “Santa Susanna” on November 9, 1930, the Dresden German Nationalists introduced a request to parliament which was aimed to attack Hindemith and the leading Jewish pianist Paul Aron. Three weeks later, the very same paper openly attacked the “Jewish concert entrepreneur Aron”. It took roughly two years, before these pitched attacks became the legitimate national policy. The seemingly ideal world among Dresden’s musicians who could not prove their Aryan heritage was about to break apart. When the Nazis came to power in 1933, Jewish musicians fell from favour and were about to be persecuted. In the evening of March 1933, SA troops occupied the opera house and the play theatre. Shortly thereafter, conductor Fritz Busch, Alfred Reuter, who was general manager of the theatre, and many others were divested of their offices. Except for five singers, all the boards of directors and the soloist ensemble agreed to the relief of Alfred Reuter and Fritz Busch in writting. On April 7, 1933, one month after Busch had been banished from the conductor’s desk, all the musicians of Jewish descent living in Germany experienced a unprecedented situation. By law governing the reestablishment of officialdom and the included Aryans’ article (”Gesezt zur Wiederherstellung des Beamtentums” with the “Arierparagraph”), all the functionaries of non-Aryan descent had to retire. Among those regarded as non-Aryan, were everyone who descended from non-Aryan, particularly Jewish parents, or grand-parents. Henceforth, the requisites for this profession were no longer based on skill but on ancestry. Over night, almost all employed musicians, educators of music and music journalists became unemployed. Moreover, the new law served as a tool to remove undesired appointees, above all members or sympathisers of the Social-Democrats’ Party, Social Workers Party, and the Communist Party Germany. Paul Büttner, composer and art director of the conservatory, was released from his office as a Social-Democrat without previous notice, in May 1933. His wife Eva Büttner, an art critic, was hit even twice: she was a Jew and a Social-Democratic assembly woman of the Saxon Parliament. A fraction of Dresden’s Jewish population made the decision to go into exile. This choice – despite its consequences concerning both social life and the psyche – proved to be life-saving. One of the most prominent emigrants was Paul Aron, who was no longer allowed to fulfil his task as teacher for music majors at the “Orchesterschule der Sächsischen Staatskapelle”. It followed singers of the national opera Margit Bokor, Maria Elsner, Peter Pieroti; repetitors of the national opera Josef Golstein and Robert Kinsky; as well as musicians of the “Dresdner Philaharmonie” Mischa Rakier and Salomon Engelsman; similarly other musicians of Jewish ancestry or opponents of the new policy were at risk. Musical Director Arthur Chitz was one of the few dissmissed officially not until 1934 from the Dresden municipal theater. In 1935 Richard Engländer was fired from the “Orchesterschule der Sächsischen Staatskapelle”. The majority of the 5000 Jews who had lived in Dresden in 1933, stayed in Germany. Many of them did not leave Dresden – perhaps hoping that the situation would not deteriorate any further. Consequently, musicians and other artists after a first state of shock had to find their own way to get through the situation. There was only one institution which could serve as a basis for help: the Israelis’ Religious Community in Dresden. Besides a number of task and problems, it had developed a form of an artists’ agency – an agency tasked with the placement of unemployed Jewish musicians and actors, which organized events for a partially equally unemployed Jewish audience. In the summer 1933, the Jewish religious Association prepared the foundation of an organization, such as one pre-existing by authority of the Prussian government in Berlin, namely “Kulturbund Deutscher Juden” (Cultural Assaociation of German Jews); renamed April 26, 1935 “Jüdischer Kulturbund Berlin e.V”; (Jewish Cultural Association Berlin). While they strove to establish a similar local institution, the artists in Dresden contributed the department “Jewish Help for Artists’ under the cover of the Jewish help committee. Since July 2 1933, they arranged numerous art events at various venues in Dresden. On October 30, 1935 the opening of the Jewish Cultural Association took place at the Synagogue. This association continued the activities of the Jewish artists’ agency. Consequently, a variety of musical events began to develop. They all had to be carried out under the supervision and observation of the Nazis. As a result, a series of events evolved – only Jews were allowed to feature and only Jews were allowed to appear in the audience. For each event one had to file an application containing all details to national officer Hans Hinkel, Prussian Ministry of Science, Art, and national education. Only with a permit granted, could the events be carried out. From 1933 to 1938 these mostly musical events, had not only featured the professional musicians of Dresden, as singer Herta Mautner-Falk, Bella Erdoes-Herzfeld, Sabine Jurmann and Irma Infeld, pianoplayer Margarete Anschel-Hofstein and Leonhard Prinz; or the unemployed musicians Walter Goldmann, Alfred Wittenberg and Paul Blumfeld. The last three founded a piano trio. In Dresden an ensemble arose out of necessity: a company of Jewish choir and instrumentalists (”Jüdische Chor- und Instrumentalgemeinschaft“) that gave many concerts. Head of the group were Walter Goldmann and Siegfried Sonnenschein. However, the reestablishment the Jewish Youth Orchestra could not be realized in 1933. Instead, many highly talented musicians who still lived in Dresden were involved in events to which belonged violinist Heinz Meyer (after 1945 Henry W. Meyer), pianist Fritz Meyer, violinist Rosa Satsch as well as saxophonist and accordionist Rolf Neuding. Moreover, amateur singers such as Rosi Elb and violinists Walter Grün and Harry Meyer, who all lived in Dresden, also participated in the program. Still, the needs of the Jewish audience could not be met due to the small number of musicians who had stayed. As a result, numerous foreign, often internationally popular soloists and artists who were members of other Jewish cultural associations in Germany appeared in Dresden. Among them were singers Paula Salomon-Lindberg, Fritzi Jokl, Alexander Kipnis and Max Kuttner, the duo with violinist Boris Schwarz and pianist Joseph Schwarz, as well as cello player Stefan Auber, who had once worked in Dresden. In the meantime, many contributors came to Dresden from international tours such as the young musicians Tanja Ury-Zunser and Miriam Zunser, or exiles like Paul Aron and Szymon Goldberg. Compared to Berlin, Hamburg, Cologne or Frankfurt-Main, Dresden was a small community and therefore could not finance a larger opera, theatre, or instrumental ensembles. This insufficiency was compensated by newly formed musical and theatrical ensembles from Berlin, Hamburg and Leipzig. That way, the Orchestra of the Cultural Association of Jews in Germany (later named Orchestra of Jewish Cultural Communities) visited Dresden and appeared on stage twice, the conductors were Josef Rosenstock and Julius Prüwer. Furthermore, the Berlin Opera Ensemble Dr. Willi Aron and the Winawer Choir with 40 singers, which was founded in Berlin, gave guest performances in Dresden. Additionally, Dresden also experienced various humorous, literary, and educational events. Music played an equally important role in other social events of the community or in events for children. Initially, in the “Jewish Help for Artists” concerts, opuses of typical composers were performed. However, once Jewish musicians were no longer considered Germans and as they were no longer allowed to play German composers’ music due to the Nuremburg Laws of September 15, 1935, the programmes had to be rearranged. Naturally, the music of Jewish composers was increasingly staged – even if the composers were of German nationality. Thus, Dresden was often exposed to the music of the following composers: Hugo Leichentritt, Arno Nadel, Karl Meth, Herbert Fromm, Max Kowalski, Julius Weinberg, Walter Leigh, Salomone Rossi, Gustav Mahler, Ernst Toch and Issay Dobrowen. In 1937, when the community organized a children’s afternoon by staging a performance by children, Joseph Hayden’s “Children Symphony” and the game for children “We build a city” by Paul Hindemith were to hear. 12-year old Fritz Meyer played the piano part. As 1937’s seasons highlight was considered Dresden’s world premier of the biblical scene “Balak and Bilam” of cantor Hugo Adler from the German city Mannheim. For this performance, the association arranged also a choir of amateurs. Meanwhile, it was again necessary to adapt the arranged programmes to the fact that many originally announced artists, because they had suddenly left Germany. For this reason, the advertised evening with violinist Stefan Frenkel, who had worked in Dresden, did not take place in 1935. Due to immigration, the community of musicians in Dresden became more and more limited. So, the association had to be creative and inventive. As a result, adaptation to special situations had to be realized. In order to prove that they could stand their ground, they left no stone unturned. Nevertheless, the two very passionate musicians Arthur Chitz and Richard Engländer were not found to be contributors to the program of the Cultural Association. Although both of them still lived in Dresden after they were fired from respective institutions, they were not only precluded from public musical life but also from the already alienated musical life of Jews in Dresden. Despite their protestant belief, their Jewish ancestry served as grounds to treat them as all the other Jews but was still not enough to allow them to participate in Jewish cultural life. Obviously, the Jews’ musical and cultural life in Dresden became ghettoized and so revealed appalling abnormalities. While Dresden staged two celebrated world premiers of the Richard Strauss’ operas “Arabella” on July 1, 1933 and “Daphne” on October 15, 1933, more than 70 other events of the Jewish Aid for Artists and the Jewish Cultural Association took place between July 2 and October 19, 1933. They were all almost unnoticed. This Jewish musical life, which was independent and established from necessity, was excluded and concealed from the public; for this was never mentioned in the official specialized or daily press. Only the still tolerated Jewish press - all the Journal of the Israeli’s religious community – published countless articles concerning these performances penned by reporter Eva Büttner from Dresden. Her contributions reported meaningfully on musicians who still lived in Dresden or those who - again - gave guest performances and were on concert. These events were incomparable in form and content perhaps even due to the circumstances. Furthermore, her articles are often the last clues to performances of Jewish artists on German territory before they either went into exile or perished and, eventually, were forgotten. Between first and last performance, the Jewish musicians in Dresden had to suffer cruelty and had to deal with broad interdictions and regulations. Little by little, the daily inevitable and essential procedures were first exacerbated psychologically and then de facto made impossible. During the the so called “Kristallnacht” – the night from November 9-10 1938 – the Synagoge in Dresden built by Gottfried Semper was set on fire and destroyed, moreover, Jewish shops, offices, and medical practices were damaged and pillaged. The Jewish press was entirely prohibited. Consequently, music was understandably out of place for Jewish population. Almost all people involved in the musical activities of the Jewish Association fled to other countries. Even if those performances of the Jewish Cultural Association, which were excluded from public, and those escapees from Dresden would have remained, the mentioned circumstances prove that the regime of the national socialists had decimated the once thriving musical life of Dresden. Further incidents and tragic fates of those musicians who had once worked in Dresden provide scene of destruction or rather of the apocalypse. Resi Elb, Singer, born 1888 in Hamburg, and music critic Dr. Richard Elb, born 1881 in Dresden, never returned after their deportation to Riga. Ernst Lee, Music-entertainer born in 1897 in Dresden, was deported to Auschwitz, and is considered missing in Riga. Erwin Schulhoff, born 1894 in Prague, was composer and pianist and had worked in Dresden for over one year, died on the August 18, 1942 in an detention-camp in the Bavarian city of Wülzburg. Four out of those artists who worked in Dresden before 1933, rank among those who survived the concentration camps: violinist Heinz Meyer had overcome several concentration camps, lastly the external camp Ohrdruf, Germany near Buchenwald; music teacher and violin player Toni Weigmann, music teacher Salka Falk and actor Siegfried Lewinsky returned from Theresienstadt to Dresden. In a hideout, two averted deportation: Eva Büttner, the reporter of events of the Jewish Cultural Association Dresden and composer Karl Freiherr von Kaskel. Being a semi-Jew, music teacher Maja Gotthelf survived in Dresden. Dozens of musicians went into exile. First some went to European countries; then, after some time or directly even they went to Palestine, China, the USA and other countries on the American continent. With this publication - the “Dresden-list” – I have attempted to reconstruct and document the missing history of the music and individual fates by word and in vision. The silence lasted way too long to present the full picture of persecution of the musical community in Dresden. Even this contribution constitutes only a laboriously compiled fraction. Ladies and gentlemen, maybe you concede that such a paper, a paper with such content, should have never come into existence. Moreover, I do not want to keep it secret that for me working on that topic, it was not always easy to isolate shaking biographic facts from my emotions. When, in 1995, I first started to take an interest in this episode of Dresden's musical history, there were no publications dealing with the topic. It was necessary first of all to assess the Nazi literature of the period. That initial research provided me with the names of some one hundred composers, musicians, musical theorists and journalist of Jewish origin, who had some connection with Dresden's musical life. All the more surprising, therefore, were my subsequent findings that at least nine of the musicians who were born or worked in Dresden died in the Holocaust, three others managed to survive the concentration camps, and two avoided persecution by going into hiding. The remainder saved their lives by fleeing the country and becoming exiles in Czechoslovakia, Sweden, Palestine, China, Japan, USA and other countries of the American continent. Those musicians who did not join the first wave of exiles created within Dresden's Jewish community - as in other German towns - the Dresden Union of Jewish Culture (Jüdischer Kulturbund Dresden). The German press of those days made no mention of its existence. Musikstadt Dresden und nationalsozialistische Judenverfolgung 1933-1945 in Wort und Bild. The Dresden List: Music City Dresden and the National Socialist Persecution of Jews, 1933-1945, in Words and Pictures. A Contribution to the History of Music in Dresden. Many books on the history of music in the National Socialist era have been written in recent years, dealing variously with composition, production, performance, and theory. All of these areas are synthesized in this work, as it focuses on a narrowly defined subject matter. 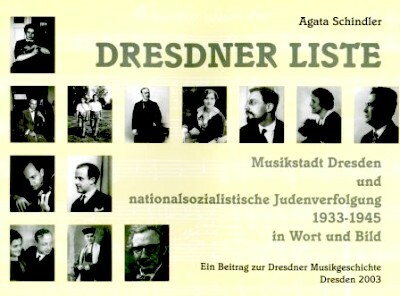 Agata Schindler has made research on the Jewish music community in Dresden her life’s work. Her considerable collection of memorabilia provided her with the essence as well as the illustrative matter for this book, which covers 151 Dresden musicians comprising the ”Dresden List,” of whom 71 were completely excluded from the Dresden’s music scene after 1933. Twelve representative biographies demonstrate the substantial contributions the Jewish community had for centuries made to the Dresden music scene, both sacred and profane, underscoring their loss after 1933. The organization of this clearly laid-out treatise is reminiscent of an exhibition catalog. Schindler’s portrait of Jews in the musical life of Dresden is of more than narrow local interest; it serves to remind us of talented creative people who were outcasts purely for reasons of race.